I received a truly sneaky PayPal.com email today, I still am not sure if it is real or fake, it looks very good. I have received similar ones in the past, the thieves keep raising the bar, these thieves are too clever. I never click on anything related to PayPal.com, Western Union, or any internet system that has my debit card on file. I kind of need to open the emails just to check, but this is dangerous, truly a lose lose situation. Aaagh, they somehow treat email about the same as snail mail. 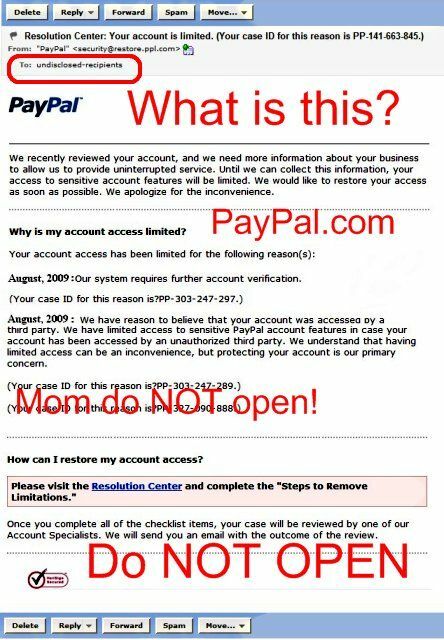 NO, please, please, never open a paypal.com email, there are thieves out there trying to trap you Mom and Dad. Who knows, I am a smart boy, but to open a Paypal.com emails is unsafe under any and all conditions, just not worth the risk. I got on Western Union yesterday here in the Philippines, for some reason it says I have a user name. I do not have a user name, I logged in with my email as the user name in the past. So I tried to do that send me a new username thing, it did not work, no explanation, just sat there doing nothing, unprofessional to say the least. I suspect I am in one of the higher cheat-the-western-union systems countries on planet earth, the Philippines. I will now have to call, hello folks, I am not in the USA, I am sorry, I live a life less normal.... blah blah blah. Hmm, there are few girls who hang out in the VFW here in Bauang, my curiosity is this, and how many men do they have lined up sending them money? The scams are endless, these are confidence games. You trust Paypal.com, people know you have confidence in the system and thieve hook on to your trust of paypal and take advantage. Kind of a friend of friend recommended this person. Girls say, “I love you,” a person that loves you would not steal… or would they, there is a financial moral high ground, often it is not theft in their mind, you are rich and I am poor, you can afford it. PalPal.com and Western Union are two players in the Soap Opera on Steroids called the Philippines, fun stuff, a never-ending story. I went online and checked my PayPal.com account, I cannot find a problem, now I will need to check if a few times and follow up, what an annoyance.